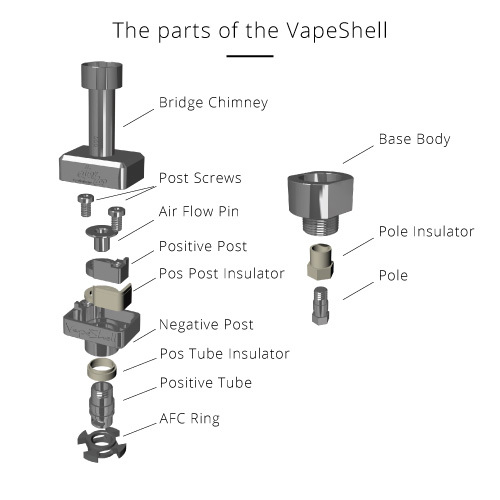 This is the support page for the VapeShell. The page will be updated gradually, as more feedback and inquiries keep coming in. 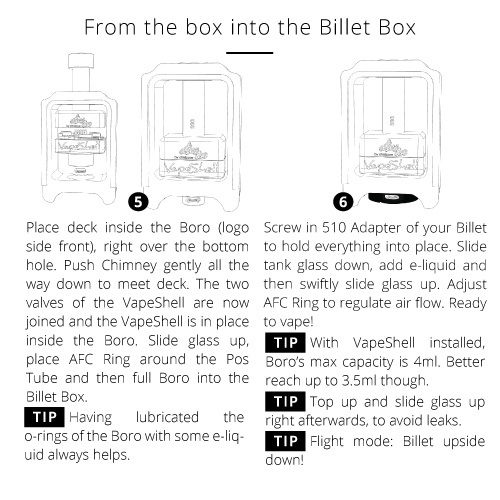 There is no need for boiling/cleaning preparation of your new VapeShell before first use. All parts are cleaned in ultrasonic bath and sterilised with hot steam before assembled and put in the box. However, before using your VapeShell for the first time and after any washing/maintenance of its components, always lubricate the o-rings and the surfaces of collaborating parts, by using your e-liquid as a lubricating medium. This will ensure long life and optimal function of the device and its real time adjustments. 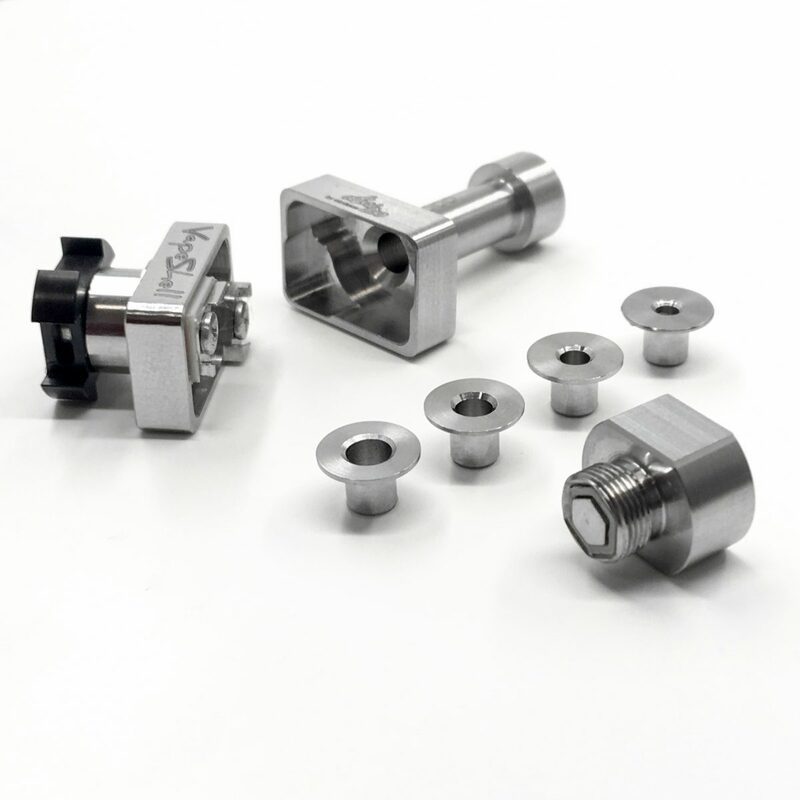 Parts like AFC Ring, MTL Air Flow Pins and Classic Air Flow Pins need this, more than any other part of the device. Especially red and transparent white o-rings should be handled with attention while assembling/disassembling, as they are silicon o-rings (thus softer than NBR black o-rings). Both Classic and MTL Air Flow Pins are air flow reducers, that are designed to allow setting up the VapeShell for a very wide range of vaping profiles, from tight MTL to open DL. The MTL Air Flow Pins have an obvious way of collaborating with their hosting Positive Tube hole. Having an o-ring around their neck, it is easy to insert or remove/replace them. 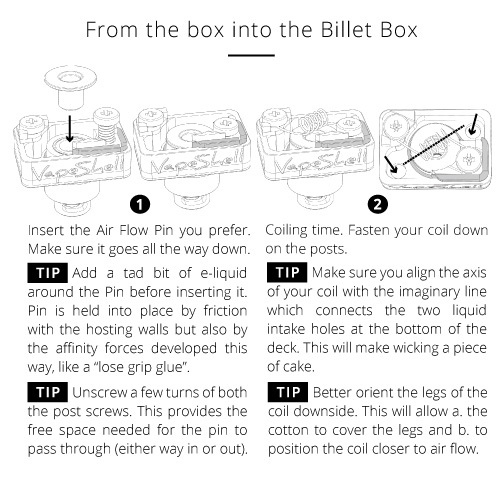 The Classic Air Flow Pins now (the ones that come with the VapeShell out of the box) have a completely different installation procedure. By design they did not allow an o-ring around them, so collaboration with the Positive Tube hole is ensured via friction and / or affinity forces. After 1st VapeShell batch, we have ensured that the friction between the pins and the Pos Post / Pos Tube is even more intense, to avoid any slightest chance of random disassembly while carrying your Billet with you. 1. Apply some e-liquid around their neck (acts as a lubricant) and then insert them into place all the way down, until flush. This might require some extra force of your fingers or using a small flat-head kind of tool, e.g. a pen. 2. Follow assembly steps of the following video. Might seem a tad bit more time-consuming but ensures 100% success. There are many ways to remove / replace the Classic AF Pins, easiest being to unscrew the Positive Tube from its place, with the help of a paper clip. This is the reverse procedure of installation way no 2 as per above. Just insert the paper clip through the slots of the Pos Tube and turn anti-clockwise. This will disassemble the pos tube from its place, also this way pushing the Air Flow Pin off the tube. 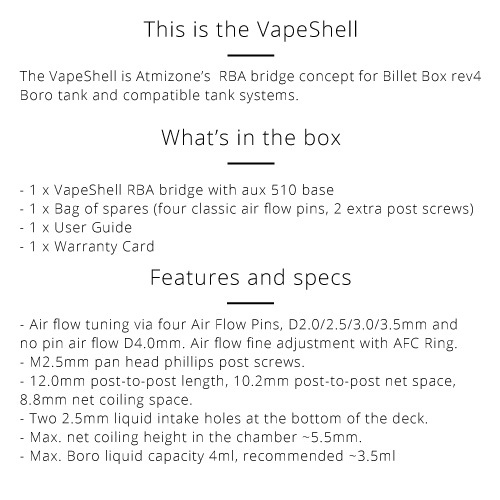 The deck of the VapeShell is rather big for a BB bridge, allowing many different one-coil setups and experimenting. Here is a quick presentation of rebuilding steps in a short video. Rebuilding procedure is quite straightforward, however there are some useful tips you need to know before rebuilding. The endings of the cotton should be placed right above the liquid intake holes. If placed higher, the liquid can enter without any obstruction inside the deck, thus causing a typical flooding and also a bubbling effect. – Higher VG (thicker) liquids —> less cotton plus place higher above the liquid intake holes of the deck. – Lower VG (thinner) liquids —> more cotton plus place lower (closer to) the liquid intake holes of the deck. – Open air flow (via wide opening of afc ring or wide air flow pin) —> less cotton plus place higher above the liquid intake holes of the deck. – Tight air flow (via reduced opening of afc ring or narrow air flow pin) —> more cotton plus place lower (closer to) the liquid intake holes of the deck. Pole screws should be screwed down all the way in order to grab the coil edges firmly in place. Do not overdo with this, as this will end up to wear and tear much quicker than normal. Don’t forget the purpose: The wire should have a firm electric connection with the poles. You won’t need to hang anything from the coil, so there is no need to use all the torque of the world when screwing down. Dry hits? If you are having them, then it’s one of the following: Either too much cotton, or cotton edges stuffed inside the liquid intake holes. Flooding, gurgling, bubbling? Then the cotton quantity is quite probably too little, or cotton edges are placed way above the liquid intake holes. In both cases, cotton edges should stay right above the holes. Not stuffed inside them, or else they will obstruct liquid from getting in the deck with every puff. Not way above, or the liquid will go in unobstructed, instead of sucking in the cotton. After rebuilding, use a pointy tool or the tip of your liquid bottle to poke cotton edges up a bit off the liquid intake holes. Example shown in following photo. The aux 510 Base that comes with each device out of the box, is an assembly of a base body, a pole and an insulator, as these parts appear inside the manual Graph (see above). This assembly essentially is a 510 adapter to help screw the VapeShell onto any 510 connection, either a mod or a rebuilding base like the Hive v2. This gives you the opportunity to have many additional features, such as testing your coil or help with easier rebuilding. 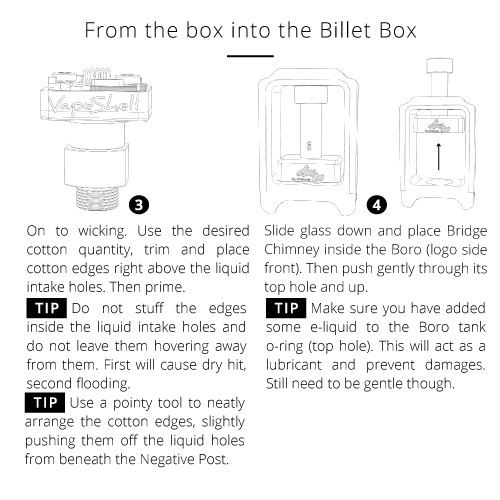 Given the fact that Billet bridges are normally incompatible with the general vaping norms, the Base is a connection between the Billet world and the rest of the vaping reality. Some useful docs about the VapeShell. Pole screws should be screwed down all the way in order to grab the coil edges firmly in place. Do not overdo with this, as this will end up to wear and tear much quicker than normal. Don’t forget the purpose: The wire should have a firm electric connection with the poles. You won’t need to hung anything from the coil, so there is no need to use all the torque of the world when screwing down. Hello Brazgon, many thanks for getting in touch about this issue! Starting with the easier part of your communication, the 510 aux base is indeed supposed to be screwing somewhat loose with the VapeShell, only becoming steady when the VapeShell is fully screwed on top of it. 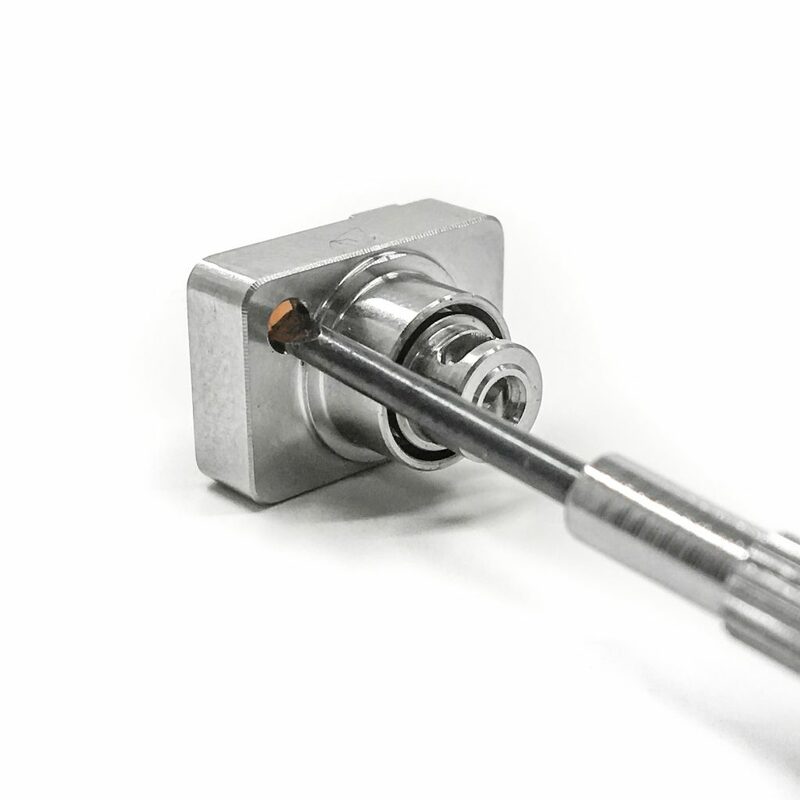 This is caused by design, as the connection between base and VapeShell is achieved with the help of this small-diameter, threaded rod which you can see if you look inside the aux base (top view). Definitely not an issue with your device, if the case is as described above. Now, about the temp protection message. This could be the result of various causes. What is the setup you are having inside your VapeShell? Since you have checked and excluded everything else, pls make sure you have inserted the air flow pin of your VapeShell fully in, until flush. If not flush, there is a chance that the pin touches the wire of your setup, thus causing the issue. After many investigations trying another bridges and all of them working perfectly .. but i think the vapeshell connection to the billetbox have some issues .. regarding the 510 adapter it was working fine before but now its very lose and its hard to warm the coils using other regulated devices with that 510 adapter not holding the vapeshell very well .. so i did what you said . Im still having the same issue .. i even tried to change the screw holding the coils to see and still same issue with the vapeshell .. i know vapeshell is a really high quality material and i really love using it but i hope that i can fix this issue so i can enjoy it more .. if there’s any chance i send you the vapeshell via email and see if there’s any issue with it ? Thanks for the additional info! What about checking out the air flow pin scenario? Could this be puzzling your resistance values? Have you made sure it is fully inserted into place, all the way down until flush? It would be best to choose a courier service option, so as to avoid unwanted delays via post. Hello. I’m planning to purchase the “Vapeshell” i also noticed that you sell the black “AFC Ring” Separately. Does it not come with the base Vapeshell package? AFC Ring is also included. The device comes as shown in this pic.